Special Broadcast from Opening of Cuban Embassy in Washington as U.S.-Cuban Diplomatic Ties Restored | Democracy Now! director of the Cuba Documentation Project at the National Security Archive at George Washington University. He’s the co-author of the book, Back Channel to Cuba: The Hidden History of Negotiations Between Washington and Havana. An updated version of the book, which includes the secret story of how Obama used back-channel diplomacy to normalize diplomatic relations, will be published in September. Cuban attorney based in Washington, D.C., who represented Elián González in 2000-2001. He also represented the Venezuelan government in its efforts to extradite Luis Posada Carriles. History is being made in Washington today when Cuba raises its flag and officially reopens its U.S. Embassy after 54 years. Hundreds are gathering for this historic moment, including U.S. and Cuban lawmakers and diplomats, activists and artists, scholars and historians. Cuban Foreign Minister Bruno Rodríguez is leading a delegation of over two dozen officials from Havana, including Cuba’s chief negotiator, Josefina Vidal. Also among the attendees is Cuban singer-songwriter Silvio Rodriguez and former Parliament President Ricardo Alarcón. This afternoon, Bruno Rodríguez will hold a joint news conference with Secretary of State John Kerry at the State Department, where Cuba’s flag was raised earlier this morning, joining the flags of more than 150 other countries that have diplomatic relations with the U.S. In Havana, the U.S. Embassy will also reopen its doors today. Kerry is set to travel there later this summer for the formal inauguration ceremony where a U.S. flag will be hoisted. Cubans have welcomed the diplomatic rapprochement with jubilation. For more, we’re joined by Cuban-American attorney José Pertierra and Peter Kornbluh, director of the Cuba Documentation Project at the National Security Archive at George Washington University. AMY GOODMAN: This is Democracy Now!, democracynow.org, The War and Peace Report. I’m Amy Goodman. We’re broadcasting from Washington, D.C., where history is being made today. In a major diplomatic thaw, Cuba will raise its flag here and officially reopen its embassy after 54 years. Hundreds are gathering for this historic moment, including U.S. and Cuban lawmakers and diplomats, activists and artists, scholars and historians. Cuban Foreign Minister Bruno Rodríguez is leading a delegation of over two dozen officials from Havana, including Cuba’s chief negotiator, Josefina Vidal. Also among the attendees is Cuban singer-songwriter Silvio Rodríguez and former Parliament President Ricardo Alarcón. This afternoon, Rodríguez will hold a joint news conference with Secretary of State John Kerry at the State Department, where Cuba’s flag was raised earlier this morning, joining the flags of more than 150 other countries that have diplomatic relations with the United States. In Havana, the U.S. Embassy will also reopen its doors today. Kerry is set to travel there later this summer for the formal inauguration ceremony where the U.S. flag will be hoisted. Cubans have welcomed the diplomatic rapprochement with jubilation. This is Professor Alberto Matos. ALBERTO MATOS: [translated] For us, this is significant. It’s important. I think it’s a decisive step toward normalizing relations. In other words, as Cubans, we celebrate this and are waiting to see what could happen and what could continue from this point on, which we are optimistic will be things that are feasible for the Cuban people and the people of the United States. AMY GOODMAN: The Cuban Embassy, which I am standing just across the street from, was built in 1917, almost a hundred years ago, becoming the first diplomatic building in this neighborhood and helping to establish this area as a diplomatic center. Fidel Castro visited the embassy in 1959 after he overthrew Cuban dictator Fulgencio Batista. Two years later, in 1961, the United States unilaterally broke off relations with Cuba. The last time the United States and Cuba had diplomatic ties, President Dwight Eisenhower was in office. Today’s opening of embassies is just the first step in normalizing relationships between the two countries. On Wednesday, Cuban President Raúl Castro applauded the diplomatic renewal but called on President Obama to use his executive powers to remove the ongoing U.S. trade and financial embargo. PRESIDENT RAÚL CASTRO: [translated] The revolutionary government has the willingness to advance in normalizing relations, convinced that both countries can cooperate and coexist in a civilized manner, for mutual benefit, beyond differences that we have and that we will have, and contribute to peace. We hope that the U.S. president continues to use his executive powers, that he can use as president without congressional interference, to dismantle aspects of this policy that has damaged and caused hardship to our people. AMY GOODMAN: That was President Raúl Castro. Meanwhile, White House spokesperson Josh Earnest has dismissed such opponents as a vocal minority with entrenched partisan interests. Speaking Friday, Earnest said U.S. restoration of relations with Cuba has strong support in Congress. PRESS SECRETARY JOSH EARNEST: There exists bipartisan support for advancing the policy that the president announced to normalize our relations with Cuba, but there have been some entrenched partisan interests that have tried to block this in Congress so far. Fortunately, there are a number of steps that the president can take, using his executive authority, to begin to make these changes. The president is implementing these changes because he believes it’s in the broader strategic interest of the United States. AMY GOODMAN: For more, we’re joined now by José Pertierra. He is a Cuban attorney based in Washington, D.C., who represented Elián González in 2000-2001. He also represented the Venezuelan government in its efforts to extradite Luis Posada Carriles. And we’re joined by Peter Kornbluh, who directs the Cuba Documentation Project at the National Security Archive at George Washington University. He’s the co-author of the book, Back Channel to Cuba: The Hidden History of Negotiations Between Washington and Havana. An updated version of the book, that tells the secret story of how Obama used back-channel diplomacy to normalize diplomatic relations, and particularly looks at the role of the pope in the back-channel negotiations, will be published in September. José Pertierra and Peter Kornbluh, it’s so good to have you with us on this truly historic day. People who are watching, listening right now hear all the traffic. We’re right across the street from the Cuban Embassy, which will soon hoist the Cuban flag for the first time in Washington, D.C., on the Cuban Embassy grounds in 54 years. José Pertierra, you’re a Cuban American. Talk about the significance of this. JOSÉ PERTIERRA: Oh, this is very significant. This is historic. I’ve waited for this moment all my life. In 1961, I was 10 years old, and I remember as if it was yesterday when diplomatic relations were broken. There were times when I thought I’d never live to see the day. And now that you mention flags, Amy, it’s interesting. There’s going to be a new Cuban flag hoisted in this flagpole across the street. But inside the embassy, they are going to hoist the flag that the Cuban government took back to Cuba when, on January 3rd, 1961, Dwight Eisenhower broke relations. That flag was folded, taken back to Cuba and put in a museum in Las Tunas. And it has been brought back, and it will be flying inside the embassy today. AMY GOODMAN: Why did Dwight Eisenhower, the president of the United States, cut off relations? JOSÉ PERTIERRA: Well, the United States, I think, has had a problem, as you know, and this show has presented to the world knowledge of that. The United States feels that it owns a large part of Latin America, and it was very hard for the United States to stomach a revolution that said Cuba is an independent and sovereign country, and set an example for the rest of Latin America. I think, really, there were a lot of reasons, but that really was at the time the reason and has been the reason why diplomatic relations have not been restored, until President Obama did so on December 17 by announcing it. AMY GOODMAN: Peter Kornbluh, can you weigh in on that? PETER KORNBLUH: Well, I can weigh in a little bit, but I just want to say thank you for having us here on this momentous day. There are a lot of people that never really thought they’d live to see today come, and so many people have worked for this day to arrive, and here it is right now. You know, the more sinister reason that Eisenhower broke relations was because the United States was preparing to invade Cuba, the Bay of Pigs. And Fidel Castro had his intelligence agents in Central America reporting on these preparations, and he decided he wasn’t going to let the U.S. Embassy be a “nest of spies,” as he put it, and he was going to tell the United States they had to remove almost—I don’t know—I think 70 percent of the embassy personnel, cut the embassy way down, so that it wouldn’t be a center of this espionage and preparations for the attack. And Eisenhower seized the opportunity of Fidel expelling these people, who were in fact working to overthrow the Cuban government—he seized on that opportunity as a public relations kind of hook to say, “Well, we can’t take this insult. We’re just going to break relations with Cuba.” Things have changed in the 54 years since. And now the real work begins, I think, to actually normalize overall relations beyond just diplomatic relations. AMY GOODMAN: Because, let’s be clear, the embargo has not been lifted. And that would have to go through Congress, is that right, José Pertierra? Is there any other way? JOSÉ PERTIERRA: Well, the president has a great deal of authority under the Constitution to further relax the restrictions of the embargo. But you’re right, Amy, the embargo was codified by President Clinton in a move that it seems unfathomable that a president would make, that stripped not only his powers, but the power of future presidents, to, by executive order, lift restrictions against Cuba. It codified it. And it’s sitting in Congress, and it’s very difficult to do it when you have a Republican-majority Congress, especially a Republican Party that has gone off the cliff in the last few years. AMY GOODMAN: Silvio Rodríguez is part of the official delegation, the great Cuban musician. JOSÉ PERTIERRA: The business of America is business. Isn’t that what they say? AMY GOODMAN: I mean, the U.S. Chamber of Commerce has been pushing for the lifting of the embargo. JOSÉ PERTIERRA: And Carlos Gutierrez, who was secretary of commerce under Bush, has come out in favor of the lifting of the blockade. So, yeah, it’s a tidal wave. PETER KORNBLUH: Because it—you know, I mean, because, of course, business has no politics in the end. It’s there to make money. And people see opportunities in Cuba. So, but the point is, is that we can make great strides towards better relations and normal relations with Cuba, even with the embargo in place. I think we have to be patient about that. There a lot of other serious issues, actually, that Cuba and the United States are going to be discussing from this day onward—compensation for expropriated property, the whole issue of Guantánamo, the USAID programs that are focused on promoting democracy in Cuba that are great insult to Cuba’s sovereignty. These are things that, going forward, are still going to be under discussion. But let me just say, they’re going to be under discussion under a different framework of relations, a framework of normal, nonhostile, civil ties. AMY GOODMAN: We’re going to go to break and then come back. We’ll continue with José Pertierra, learn about his story, how he came to the United States with his family from Cuba, representing Elián González and also representing the Venezuelan government in efforts to extradite Luis Posada Carriles, who still lives today in Florida. And Peter Kornbluh, also joining us, the head of the Cuba Documentation Project at the National Security Archive, co-author of the book, Back Channel to Cuba. We’ll be joined by Danny Glover and longtime activist Medea Benjamin. They are holding—Medea Benjamin and CodePink—a party outside the embassy today that will go throughout the day and the afternoon. Meanwhile, inside the embassy, 700 people will gather as the flag is hoisted for the first time, the Cuban flag, on the Cuban Embassy property in 54 years. Stay with us. AMY GOODMAN: Yes, that is Silvio Rodríguez. Silvio Rodríguez is part of the official Cuban delegation today that is led by Bruno Rodríguez, the Cuban foreign minister, who will be here at the embassy honoring the opening of the Cuban Embassy and the hoisting of the Cuban flag in Washington, D.C.
Our guests now—coming up, Medea Benjamin and actor Danny Glover, long an activist on the issue of Cuba—are José Pertierra, Cuban attorney here in Washington, D.C., represented Elián González and also represented the Venezuelan government in its efforts to extradite Luis Posada Carriles; Peter Kornbluh is also with us, directs the Cuba Documentation Project at the National Security Archive. If you would talk, José, about how you came to this country? AMY GOODMAN: And Jorge Mas Canosa, for those who don’t know or remember? JOSÉ PERTIERRA: Is the leader, well, the president of the Cuban-American National Foundation, very right-wing, extremist guy who was a friend of Reagan and Bush and so forth. And, you know, I think that my mother’s move to California saved my life; otherwise, I would have grown up in Miami. AMY GOODMAN: You have two cigars. You’re holding one. JOSÉ PERTIERRA: I’m holding one. PETER KORNBLUH: And this one. AMY GOODMAN: And you’ve got one in your pocket. The significance of these cigars? JOSÉ PERTIERRA: I like them. AMY GOODMAN: Are they legal right now? JOSÉ PERTIERRA: Yes, they’re legal if you bring—you can bring $100 worth of cigars into the United States from Cuba, but you can’t bring them in from a third country. You have to bring them in directly from Cuba. PETER KORNBLUH: —listening to the music. AMY GOODMAN: And there are direct flights. AMY GOODMAN: Can you explain what’s happening? PETER KORNBLUH: JetBlue is starting direct flights. This is—there’s going to be—the Carnival Cruise Line is actually going to start going to Cuba by taking kind of people-to-people groups instead of vacationers. I mean, we are seeing—a ferry service is starting up again, that there used to be a historic ferry service between Key West and Miami and Cuba, and now it’s starting up again. I mean, you are seeing such—and so fast the way it’s changing, the way these two countries are becoming connected again. And it’s really, really something. AMY GOODMAN: José Pertierra, you fought for this, but you’re also raising some warning flags. AMY GOODMAN: This is millions of dollars the U.S. government puts in to change the government. PETER KORNBLUH: That Congress mandates gets spent on Cuba under the Helms-Burton law. JOSÉ PERTIERRA: And what they do with that is they pay dissidents in Cuba and in Miami. Opposition to the Cuban revolution in Miami is an industry. People make money and live very comfortably as a result of it. So, the United States needs to get rid of those programs and move forward and respect the sovereignty of Cuba. Cuba does not belong to the United States. Maybe Mississippi does, but Cuba does not. AMY GOODMAN: Luis Posada Carriles, you represented the Venezuelan government. Can you explain, José, who he is and his significance even today? JOSÉ PERTIERRA: Luis Posada Carriles, Amy, was the Osama bin Laden of Latin America. He was responsible for a campaign of terror against Cuba dating all the way back to the late ’60s, early 1970s, up until very recently. He directed a campaign of bombs in hotels and restaurants in Cuba that resulted in injuries and death. JOSÉ PERTIERRA: Fabio di Celmo. JOSÉ PERTIERRA: That’s exactly right. AMY GOODMAN: —where his son died. AMY GOODMAN: This was 1976. JOSÉ PERTIERRA: Exactly—including a nine-year-old girl was murdered there. AMY GOODMAN: And the entire Cuban fencing team. JOSÉ PERTIERRA: And the entire Cuban youth fencing team with their medals on their chests. PETER KORNBLUH: They had just won. JOSÉ PERTIERRA: They had won all the gold, silver and bronze medals at the Pan American Games. AMY GOODMAN: And they were flying back. PETER KORNBLUH: It’s likely today there will be a small protest in Miami, very small, by anti-Castro Cubans. But Luis Posada Carriles might show up. And the fact of the matter is that the United States has been harboring an international terrorist that even the CIA, FBI documents show was behind the explosion on this plane. AMY GOODMAN: And you look at other moments in U.S. history, Watergate break-in, the involvement of Cuban exiles there. PETER KORNBLUH: The Letelier assassination down the street here. AMY GOODMAN: So explain, Orlando Letelier, the Chilean diplomat, and Ronni Moffitt, his assistant. PETER KORNBLUH: Killed by agents of the Pinochet government, working with these anti-Castro terrorists, collaborating. AMY GOODMAN: That, too, was in 1976, is that right? JOSÉ PERTIERRA: The bomb was set off by Cuban terrorists, right? PETER KORNBLUH: Right down the street. AMY GOODMAN: Down on Embassy Row. AMY GOODMAN: Their car was blown up. PETER KORNBLUH: There’s a whole history. But let me just say, I really want to say, this history is going to be part of a past that certainly we all have to remember. As long as Posada Carriles is in this country without justice, without being prosecuted, without being extradited, that history lives on. But United States and Cuba are poised today to move forward, to keep working on these issues of the past, that include Posada Carriles and the embargo, but to move forward in a much different way. And the fact that these flags are flying, they’re flying in a different wind, aren’t they, José Pertierra? The winds of change have come to U.S.-Cuban relations. And we really can’t forget that, as much and as dramatic as the past is between these two countries. AMY GOODMAN: José Pertierra, your own car was bombed, is that right? JOSÉ PERTIERRA: That’s right, yeah. AMY GOODMAN: When was it blown up? JOSÉ PERTIERRA: But that wasn’t the Cubans who did it. PETER KORNBLUH: Those were Guatemalans. JOSÉ PERTIERRA: Those were Guatemalans, right here in Washington. JOSÉ PERTIERRA: Comandante Everardo—Efraín Bámaca Velásquez is his complete name. And the Guatemalan military put a bomb in my car in the driveway about four miles, three or four miles from here, and it blew up. I don’t think they meant to kill me, because it was at 3:00 in the morning or 4:00 in the morning when it exploded, but it meant to scare me off the case. I remained on the case. And the Inter-American Court in San José, of the OAS, found the government of Guatemala culpable for the disappearance, torture of Comandante Everardo, and ordered compensation be paid to his widow, Jennifer. AMY GOODMAN: So, explain today, as this flag goes up, what is happening in Havana. Originally, I thought, the flags were going to go up around the same time, on this same day, on July 20th, 2015. Now, the U.S. Embassy is going to open there, as is this embassy here today. PETER KORNBLUH: It is opening today. AMY GOODMAN: But the flag won’t be hoisted today. PETER KORNBLUH: They are waiting to hoist the flag until John Kerry can get off his crutches from having broken his leg, can get beyond the negotiations on Iran and push those forward, and find a day in August to go to Cuba and be there for that ceremony. He will become the highest-ranking U.S. official to travel to Cuba since the Cuban revolution in 1959—another major step, another major publicity attraction, another indication of a much more normal relationship with Cuba. And that is due to happen sometime in August, and I think start to create a momentum. After Kerry, the pope is going to go to Cuba in September. JOSÉ PERTIERRA: And I think Obama will go to Cuba, too, before his presidency is over. PETER KORNBLUH: And I am sure—I’m going to predict on this show today that one of the things that Kerry will be doing is doing some advance work for President Obama to go to Cuba, which will be his Nixon-in-China moment and really, I think, consolidate these changes in policy. JOSÉ PERTIERRA: I agree with Peter. That will seal the deal, Amy. If he goes to Cuba, it will be completely irreversible. AMY GOODMAN: José Pertierra, you mentioned Guantánamo. It’s not closing. AMY GOODMAN: Over a hundred men are still being held there. JOSÉ PERTIERRA: People talk about violation of human rights and due process in Cuba. And I’ll tell you, Amy, there is violation of human rights and due process in Cuba, and it’s in Guantánamo. I mean, we’re holding prisoners there for years without trial, tortured them. And President Obama took the office with a promise that he would close Guantánamo as a prison, and he has not. I think he will before his term is over, but, you know, it’s been six years, and six years of prison for people without trial, six years of torture. I think he needs to do something. But beyond that, beyond closing it as a prison, the United States needs to return that territory to Cuba. That is sovereign Cuban territory. The United States has no business there. If they want a base somewhere, they can put it in Mississippi, Alabama, but not in Cuba. Cuba belongs to Cuba, not to Washington. PETER KORNBLUH: It’s one of the most difficult kind of political issues, I think, for the president. It’s kind of last on the list, and has been last on the list for all the years of discussions about how to normalize relations with Cuba, in terms of kind of the ultimate priority. It’s because of the difficulty in negotiating the return of Guantánamo. But eventually that will happen. Guantánamo will become the Panama Canal of Cuba. It will be returned, and kind of the last vestige of a kind of physical vestige of U.S. imperialism in the region and in Cuba will be over. AMY GOODMAN: So, as we look behind us, over the Cuban Embassy, there is a flag pole that was just erected a few months ago. PETER KORNBLUH: It’s very shiny. There’s a gold ball on top. It’s ready. And in just an hour or so, there’s going to be a Cuban flag waving in the wind. JOSÉ PERTIERRA: Thank you, Amy, for inviting us. AMY GOODMAN: —again, on this historic day. Fifty-four years ago, the Cuban Embassy was closed. Fifty-four years ago, the flag was pulled down. Today, it will be hoisted once again, on July 20th, 2015. Peter Kornbluh, thanks for being with us, director of the Cuba Documentation Project at the National Security Archive at George Washington University, co-author of the book, Back Channel to Cuba: The Hidden History of Negotiations Between Washington and Havana. And thank you so much to José Pertierra. He represented Elián González. He represented the government of Venezuela as they tried to extradite Luis Posada Carriles, who, to this day, lives in Florida. This is Democracy Now! 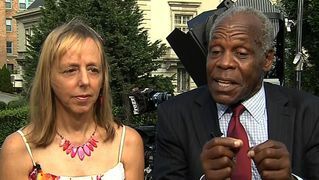 When we come back, Danny Glover, who has long fought for normalization of relations with Cuba, and longtime activist, founder of CodePink, Medea Benjamin. Stay with us.